You can reach Kolkata to Manali via flight. 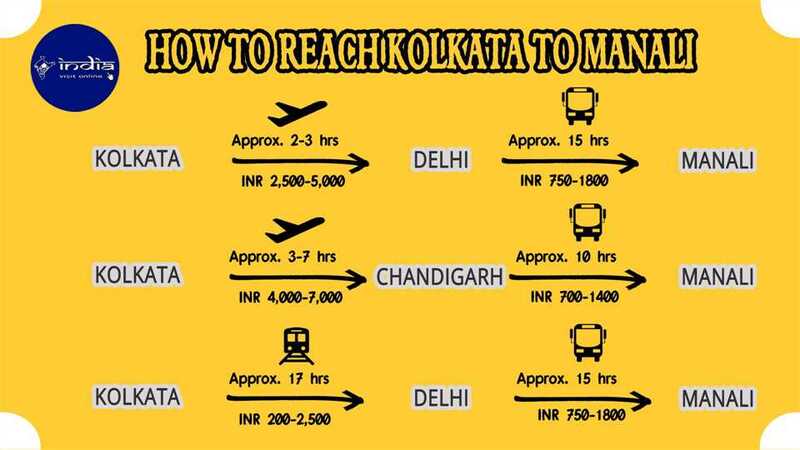 It will take around 2-3 hours to reach Delhi from Kolkata via flight. The cost of the tickets would be between Rs.2500-5000. Once you reach Delhi you can take a bus to Manali which will take around 15 hours to reach. The tickets of the bus would be somewhere between Rs750-1800. You can even book train tickets till Delhi if you wish to travel via train. Train will take approximately 17 hours to reach Delhi. The cost of the tickets would be between Rs.200-Rs2500. Once you reach Delhi you can take a bus to Manali. You can even take a flight to Chandigarh. It would take around 3-7 hours to reach Chandigarh. Once you land in Chandigarh you can opt for a bus to Manali which would take around 10 hours to reach Manali. The cost of the bus would be around Rs.700-1400.